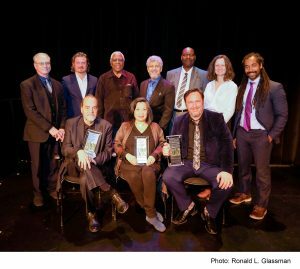 Otto Awards – All Stars Project, Inc.
Last Sunday, the All Stars Project’s Castillo Theatre held its 20th Annual Otto René Castillo Awards. These awards recognize, support and connect theatre companies and artists engaged in experimental and community-based theatre. Since 1998, Castillo Theatre has recognized over 100 theatres and artists from the U.S. and around the world. This year, Castillo Theatre presented three awards. The first award went to Collaboraction, a multicultural Chicago theatre that has focused on engaging poverty as the root cause of Chicago’s epidemic of violence. Mia Katigbak of the National Asian American Theatre Co., Inc. also received an award for her work in asserting the presence and significance of Asian American theatre in the United States. Finally, the Cuban-born playwright Eduardo Machado, Head of Playwriting in the Goldberg Department of Dramatic Writing at NYU’s Tisch School of the Arts, received an award.